3-14-12 – The Glory Hole Still Has It! We got on the road this morning at 5:30am headed to the glory hole on the Connecticut River. We went out there hoping that the ice would be safe enough for us to get on. We figured the ice off shore over deep water would be fine. When we got there it didn’t look good but we looked around. We found a few planks from past trips and were on. 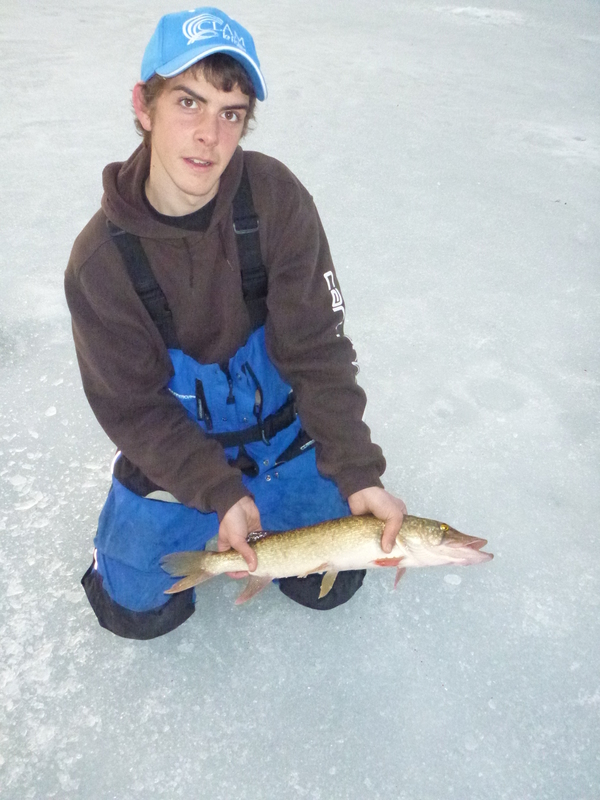 A few turns of the the hand auger and we were pushing 18″ of good ice! Because the shores were bad we packed light so we could walk through the woods to get on. We had buckets, flashers, rods, and a power auger. We punched holes and started catching fish. It didn’t take long to get into the crappie but they didn’t have much size. Past trips had similar results. 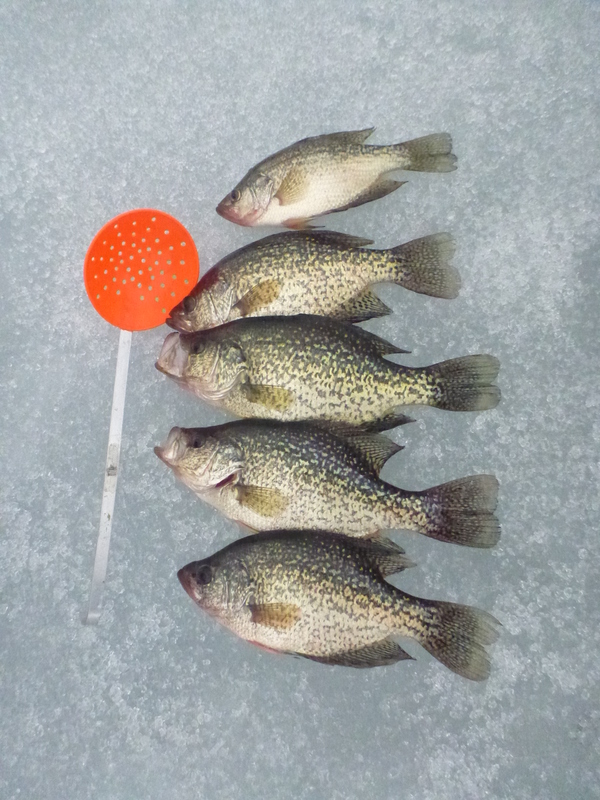 The slab crappie turn on randomly throughout the day even though there are frequently big reds cruising around. After a few fish were caught Mark hooked into a decent pike. Maybe 25″ but a good fight at that. It broke the line as it came out of the hole so we got lucky! 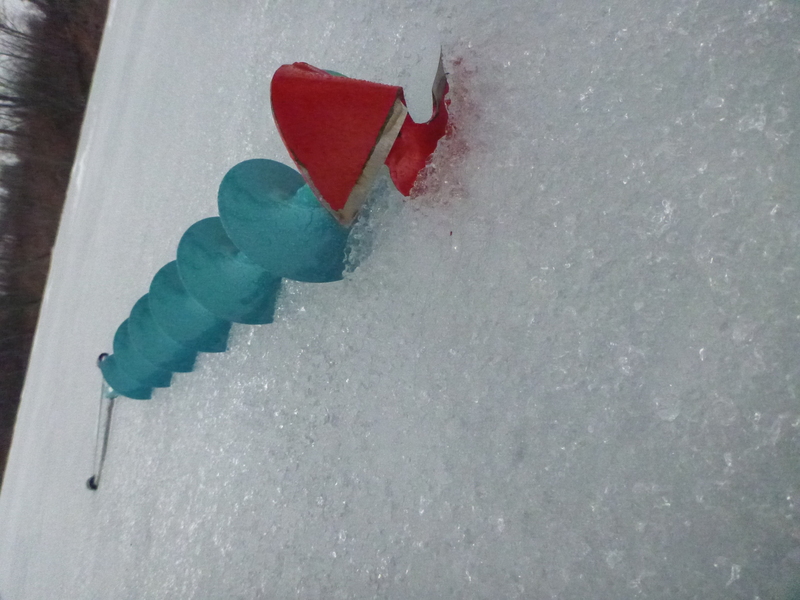 As we fished down the line of holes it was apparent that the fish were else where. We kept working the deep channel and the edges where the depth rose up into the teens. This seemed to be a good depth for the morning bite. Mark pulled quite a few quality fish out of the shallows. The one below was his first true jumbo of the day. It was pushing 13″. In the most recent of trips we haven’t caught fish like this but we didn’t spent much time looking around I guess because they were there in full force today! Shortly after the sun was up, I had my meal worth of fish in the bucket. That’s all I wanted to take and I released them for the rest of the day for the most part. As the day passed by, we caught numerous fish; upwards of the 200 mark with a few limits worth in the 11-13″ range if we were keeping them. I was releasing some dandy fish that I would have been happy to have had my bucket for a meal if I didn’t have a enough for the summer in the freezer already. Probably one of the more memorable moments of this season happened today. I had an issue today with a mink stealing fish right out of my bucket. I got a short video of his first trip out starting with it hidden right in the bucket! Click here to check it out (sorry for the sideways view). 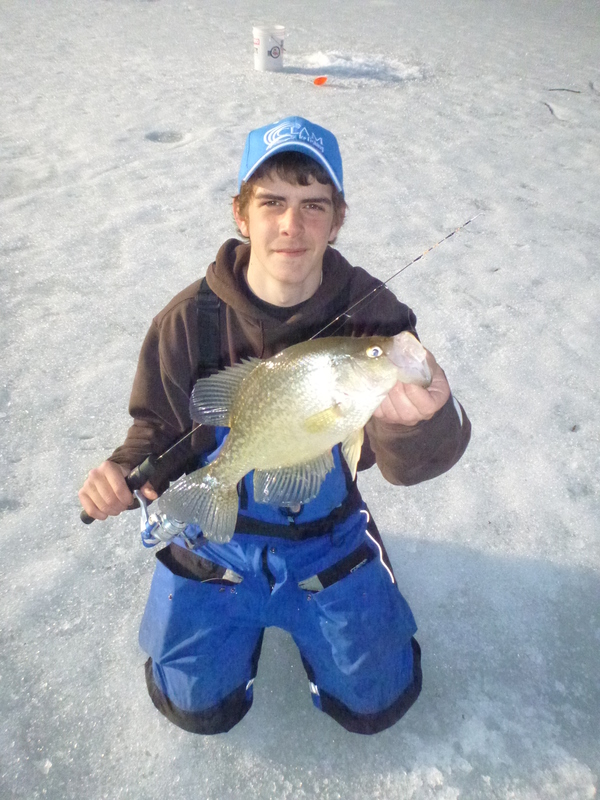 I figured a little animal like that would feast on a 13″ crappie for a day, right? Nope, I was wrong. I left my bucket where it was and he crept back out and stole another! What a jerk. I then realized I should hang onto what I had left and the mink spent quite a bit of time on the ice looking for fish that were possible left behind. Too bad we were on the ball today! Here are the fish that Mark took home for supper tonight. Looks like a good meal to me! 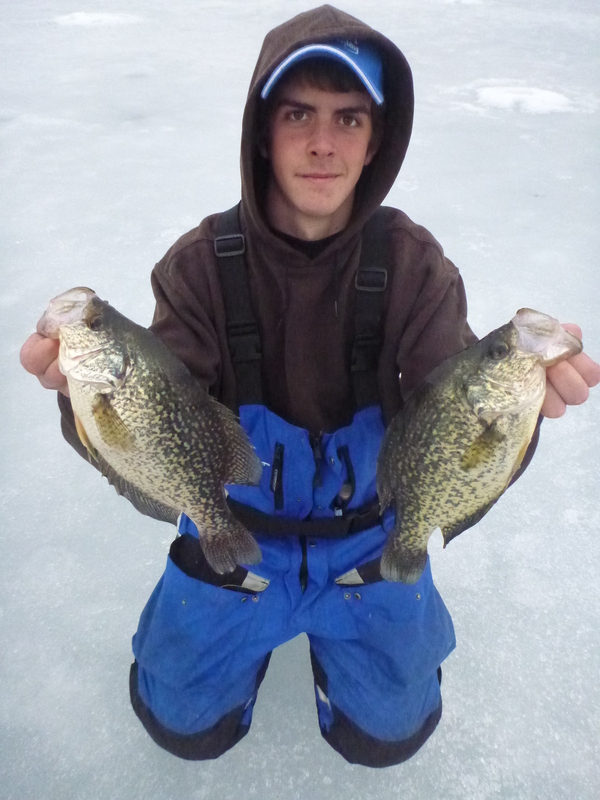 Mark at the end of the day with a nice pair of crappie. Both of us were fishing tungsten jigs today because of the deep water and the fish were deeper than usual. We normally get them between 6-8′ down but today was closer to 11-13′ with the bigger ones slightly higher. Maki Plastics increased the size of the fish greatly today. We were able to weed out a few but not all of the chips that are abundant in the glory hole. The ice was melting pretty good today. This was just after a short time! You guys have some gagger crappie in your neck of the woods. Looks like an awesome way to pass the winter. 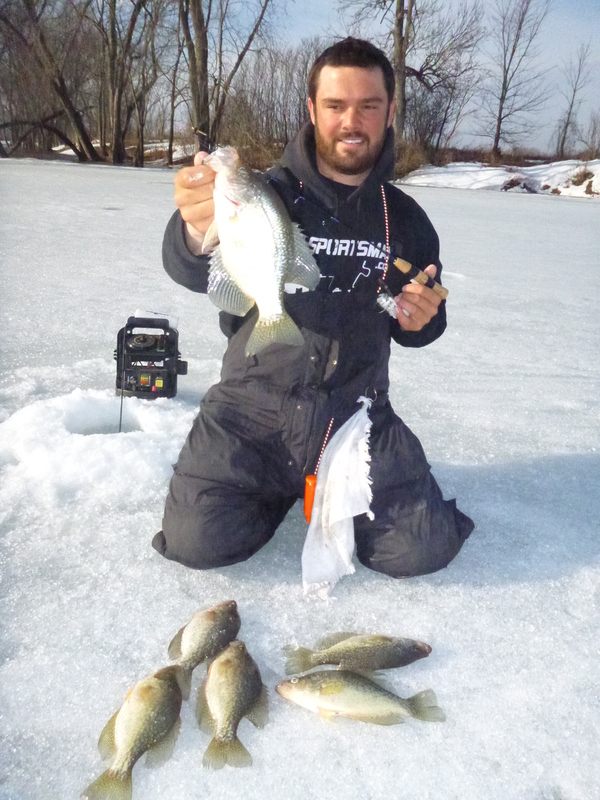 Will you keep posting now that your ice season is over? Well hopefully as much as we can. Dylan works for F&W in the summer, but I have them off, so we should post a couple times a week!